The Soulmen released version 2.8 of Ulysses on iOS and macOS today. The headline feature of the update is Touch ID support, which gives users the option to lock Ulysses automatically as soon as it is closed or after one, three, or five minutes. If your iOS device or Mac doesn't support Touch ID, you can require Ulysses to use a password instead. I don't have any particularly secret documents in Ulysses, but there are some documents I would prefer to keep private. With Touch ID, it's so easy to unlock Ulysses that turning it on was a no-brainer. Groups and filters have been enhanced too. Groups act as a sort of folder system for organizing your documents, which Ulysses refers to as sheets. On iOS, you can now get aggregate statistics for groups and filters, something the Mac version of Ulysses could already do. Swiping left on a group or filter reveals a 'Details' button. When tapped, it opens a view with information about the group or filter, including an entry that can be set to display one of 13 different metrics about the contents of the group or filter. Tapping on that statistic opens the full statistics view with all 13 data points. Group and filter statistics are now available on Ulysses for iOS. Ulysses 2.8 adds negative parameters to filters. For example, I could create a filter that includes all of my Ulysses sheets that mention 'automation' but don't contain 'Workflow.' It's a powerful tool for organizing a large database of documents that I plan to take better advantage of in the future to do things like sort archived Club MacStories articles by type. Ulysses has substantially expanded its URL scheme support too. The new x-callback-URLs make automating the manipulation of groups and sheets much more powerful. We've been testing some new workflows to manage the Club MacStories Weekly newsletter, and I know Federico is planning on sharing more on what can be done with the new Ulysses x-callback-URLs in next week's newsletter. 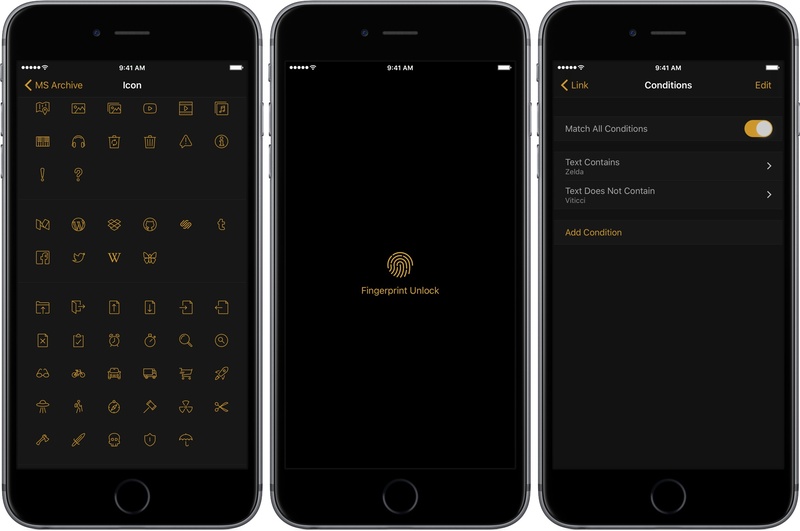 The Ulysses update also adds new icons for labeling groups and filters. It's a small change, but I appreciate the added choice because icons that fit well with what's in my groups makes it easier to find the group I want. Ulysses is already one of the premier text editors available on iOS and macOS. By letting users secure their writing behind Touch ID or a password and enhancing groups and filters, Ulysses 2.8 makes managing documents easier too, which will be appreciated by anyone with large numbers of documents. Ulysses 2.8 is available on the iOS App Store and Mac App Store.